The schism in the Parliamentary Labour Party shows absolutely no sign of being healed. The will and beliefs of the majority of the Labour membership are clear. This translates itself into the will and belief of the vast majority of the Labour constituency parties. The will and beliefs of the Labour leadership, supported said membership and constituency parties, is also very clear. That leadership put forward a truly important motion before the houses of parliament. It was a motion that, in the words of the Shadow Foreign Secretary, Emily Thornberry, “gave us the opportunity to send the opposite message to the world … that, while Saudi Arabia will remain a valued strategic, security and economic ally in the years to come, our support for their forces in Yemen must be suspended until the alleged violations of international humanitarian law in that conflict have been fully and independently investigated. And until the children of Yemen have received the humanitarian aid that they so desperately need,” she said. Personally, I don’t believe we should value the Saudis as a strategic or economic ally. It is a barbaric, religiously fundamentalist (i.e. socially backward and primitive) country that should be ostracised rather than courted. Concern over its importance due to its oil wealth is also backward and primitive in a world that needs to be rapidly turning away from fossil fuels. It is only the warped logic of the neoliberal capitalists that seeks to preserve dependence on finite resources. 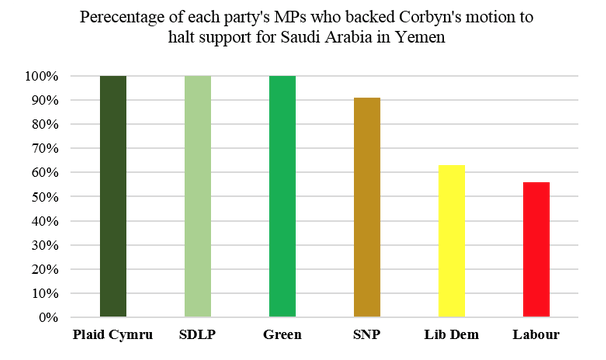 This reality underlines my utter contempt for the Labour MPs that abstained on this vote in defiance of a three-line whip from the Labour leadership. They not only stuck two fingers up to Party discipline; they not only chose to make a pathetic gesture at the cost of innocent children’s lives and well-being; they also underlined, in blood red, that they share the warped neoliberal, capitalist mindset of the Tories, to whom they handed victory in this vote. Emily Thornberry said that she was disgusted that (all but one) Tory voted against the motion and disappointed that 102 Labour MPs abstained. That should be the other way round surely! We should never expect anything else from Tories. It is a constant disappointment that anybody thinks like a Tory. What is truly disgusting, to the point of making me want to vomit all over them, is that the proud socialist heritage of the Labour Partry, that has been trodden into the dirt consistently by the neoliberal Blairites, up to and including their humiliating defeat in the recent Leadership election, should continue to be dragged down by these contemptible, self-important bastards. Well, now they well and truly have blood on their hands. And the rest of the world sees them for what they truly are. To be fair, some of Corbyn’s PLP detractors refused to get involved in this most revolting of revolts. Newspapers reported one Labour MP, who is not supportive of the Labour leader, Jeremy Corbyn, but voted for the motion, said he was frustrated and upset that a number of his colleagues were “using the issue as a way of trying to beat Jeremy. It is such as serious issue and it’s obviously going on the Tory side as well, but there is a massive humanitarian disaster here. It should not be an opportunity to score political points,” he said. But nine Welsh Labour MPs were amongst those that simply could not resist. Of course, I am especially disappointed that my own MP is heading this list – but just like with Tories, we really could not have expected anything else. Her track record of cosying up to arms manufacturers goes before her these days. She will probably be the guest of Lockheed Martin UK at the next big arms traders’ banquet. She would certainly welcome them bringing jobs to Bridgend were it ever an option. Imagine her pride at having Bridgend made cluster bombs slaughtering civilians in Yemen, like their British made BL-755 bombs that have been uncovered being used against Yemeni civilian targets by ITV. It is patently clear that Madeleine Moon and her likeminded colleagues can have no future in the Labour party that has been re-born, re-invigorated and returned to its members. They have become insufferable boils on the face of the party. They disfigure and repulse. The sooner these boils are lanced and proper healing of the sores achieved, the better for everyone involved in progressive politics in this country. P.S It was a surprise to see Paul Flynn on this list. I am told he had a genuine reason for being absent from the vote. I am happy to believe and acknowledge this. This entry was posted in Uncategorized on October 29, 2016 by Bridgend's Green Leftie. Hi Andy, good article, however surely the facts stated here challenge your assertion that the Labour Party has been “re-born, re-invigorated and returned to its members”? This vote, like the vote on Trident escalation before it, actually underlines how little influence Jeremy Corbyn and the membership of the party have over the actions of Labour MPs in Westminster.